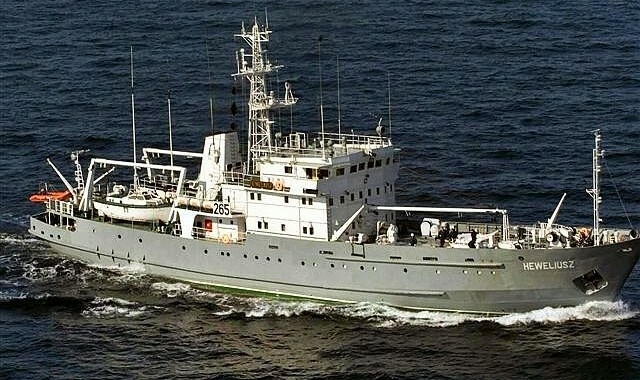 2006 r. ORP Heweliusz - Foundation "Odnalezc Orla"
According to the decisions taken in 2005 concerning the joint search of wrecks: the Polish ship “Orzeł” and the Dutch ship “O-13”, the Polish Navy sent in 2006 a research vessel ORP “Heweliusz”. The ship between March 14th and April 12th, 2006, went on a cruise planned for the Oceanology International 2006 conference and oceanographic exhibition in London. It was also planned to carry out an ORP “Orzeł” and “O-13” wreck. From the ship’s deck measurements were made at a 57 ° N coordinate position; 3 ° 40 ‘E, where during the Second World War German mines were located: 16A and 16B. The search did not end with finding the “Eagle” wreck.